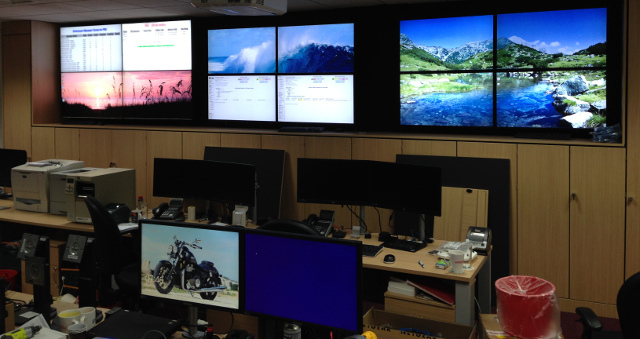 To better utilise existing resources the entire IT department has been moved to a custom designed area, as part of that move it was decided to expand the IT Monitoring Wall from 6 to 12 Monitors giving us ready visibility of our Remote Sites and Data Centres. Running a mix of customised Nagios screens, ManageEngine OpManager and DBAM Traffic Analysis we’ll get full visibility of all critical resources with audible (very audible) alarms to ensure the screens get looked at immediately should an issue arise. Each bank of 4 is running off a single PC fitted with quad DP cards. Nearing completion now and I think it looks pretty good so far… hoping we can keep at least one of those therapeutic backdrops.! Can you guess which is my desk..? Tagged Monitoring, Nagios. Bookmark the permalink.